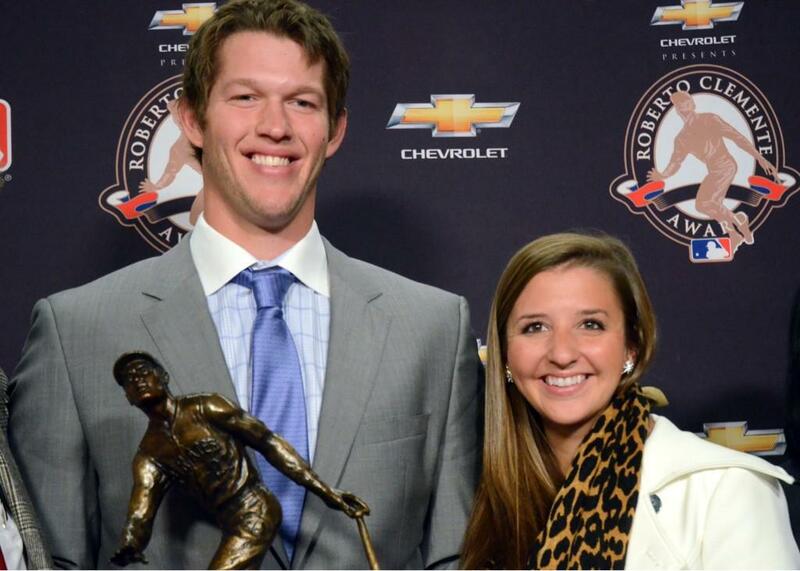 Clayton and Ellen Kershaw accept the 2012 Roberto Clemente Award yesterday evening. "(The Clemente Award) means more to me than any individual award I could ever achieve." Pic via twitter @Dodgers. I guess there was some rioting in San Francisco after their championship win. Check out the twitter hashtag #SFRiots for the lowdown. While on Haight an impromptu band formed and played for happy fans. Jackie Robinson's daughter will be joining the Board of Directors of the Dodgers, via Bill Shaikin at the LA Times. Sharon Robinson said she hoped the involvement of Dodgers ownership would help the Jackie Robinson Foundation secure funding for additional college scholarships as well as for a planned Jackie Robinson Museum in New York. "We don't see it as a sports museum," she said. "We see it as a civil rights museum." Both Clayton Kershaw and Andre Ethier are finalist for a Gold Glove, via a Dodgers press release. Ethier, 30, ranked second among National League right fielders with a .988 fielding percentage, committing just three errors in 146 games (142 starts) in right field this season. Ethier’s streak of 282 games (276 starts) from July 10, 2010-July 25, 2012 without an error was the second-longest active run among non-pitchers in baseball behind only Franklin Gutierrez and the second-longest errorless run by a Dodger outfielder behind only Brett Butler’s 306-game run from 1992-94. Kershaw, 24, completed his second consecutive errorless season and has not committed an error since Aug. 1, 2010, a span of 76 games. The Texas native led the Majors with 11 pickoffs and has either led or tied for the National League lead in pickoffs in each of the last three seasons since 2010. Steve Dilbeck at the LA Times takes a look at "The Early Promise of Paco Rodriquez." The take: You have to wear shades. Taken in the second round of the draft, Rodriguez — who we learned very quickly likes to go by Paco and not Steven — it’s been remarkably smooth sailing thus far. He never appeared intimidated, around the club or on the field. Young, hard-throwing, left-handed relievers with nice command are rarer than a speechless Tommy Lasorda. If he stays anywhere near on track, it’s difficult to imagine he won’t be back with the team next season at some point. Someone to look at down the road as a potential closer. Former Dodger Talk host, Ken Levine will be singing copies of his new book at the Grove in West Hollywood from 7:00 PM to 9:00 PM tonight! Go to his blog for more info. I just noticed this. 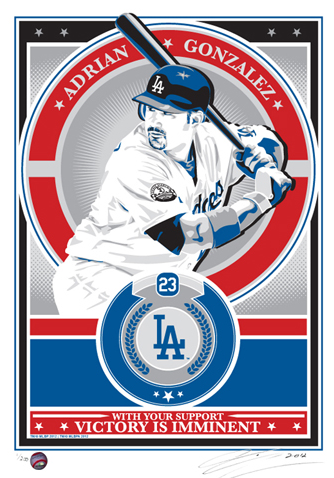 Sports Propaganda Art has a new print featuring Adrian Gonzalez in a Dodgers uniform. Go here. See it at right. Former Kings defenseman Jack Johnson lays it all down in his recent blog post concerning the NHL lockout. You go, Jack MF'n Johnson! The concept that the owners are trying to dismantle existing contracts that they in good faith offered, signed, and committed to is appalling, unprofessional, and disgraceful. I negotiated my own contract, without an agent, with the confidence and belief that the owner offering me that contract operated by the same convictions and principals as I do. During the summer, the players offered to play through negotiations and the owners locked us out. We want to play hockey! Where is the honor? I’m ready to play and uphold my end of the deal! I was doing some brief research on Todd Hollandsworth recently and discovered on Wikipedia that Todd had received an unusual nickname. Hollandsworth was a member of the 2003 World Series Champion Florida Marlins. It is in South Florida where he is believed to have acquired the nickname "God Hollandsworth". What? That's a strange nickname, and I am sitting here wondering how or why he was called that. Does anyone know. Does it have to do with his exploits during the Marlins championship in 2003? 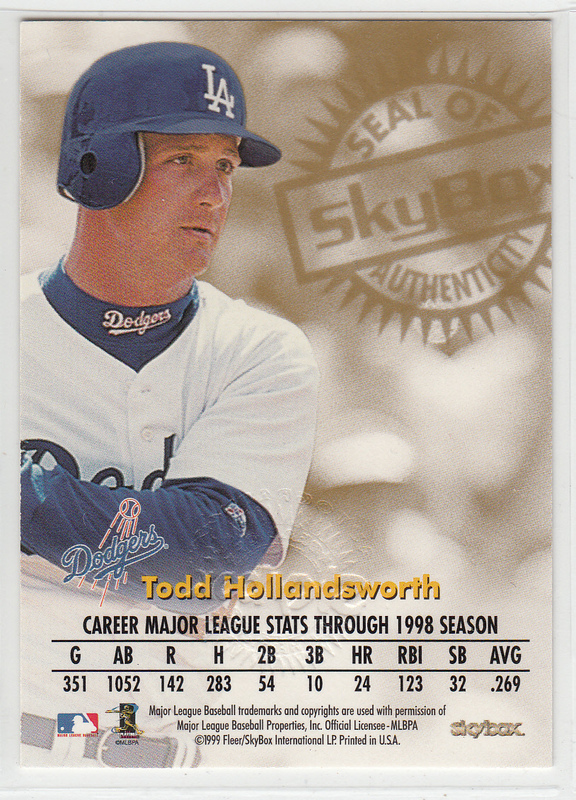 Featured here is a 1999 Skybox Autographics card of Todd Hollandsworth in my collection. Card of the Week: "**** Happens"
I haven't been very active in posting up a "Card of the Week," and I cannot promise that there will be any future post in this vein. On the other hand, maybe this winter gives me an opportunity to restart this feature. I dunno, we'll see what the future holds. 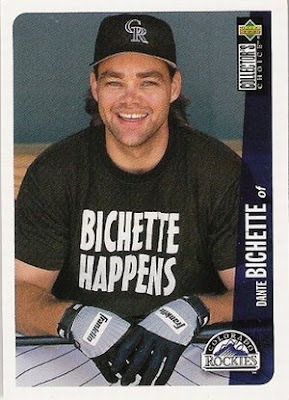 Nevertheless, with the Giants winning the World Series last night I thought this 1996 Upper Deck Collector's Choice Baseball card of Dante Bichette (#135) would be a fun way to start. After all, after witnessing yesterdays final game of the season, all I can say is "Bichette Happens!" With the 2012 Baseball season officially at a close, I think I will spend this moment to focus on a couple of great vintage memorabilia items I ran into at a Love of the Game Auction online. They are not Dodgers related, but do include some great items featuring a few old-time Hall of Famers. Take a look below. With Major League Baseball recently honoring ballplayers who have served in the military, I thought these items would be great to take a look at. 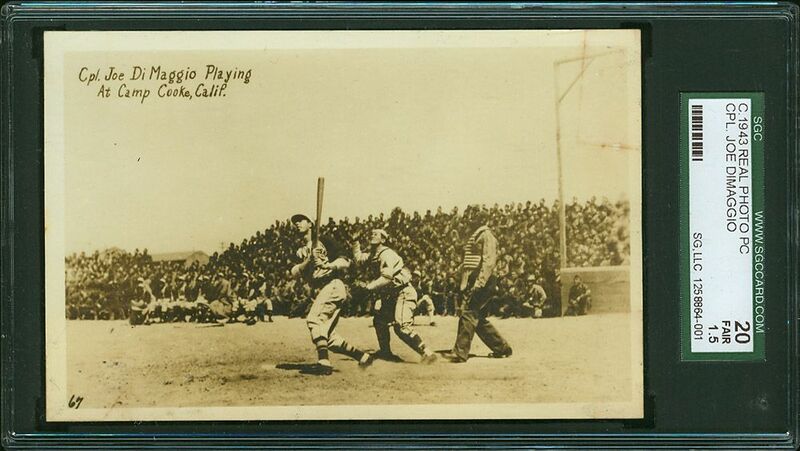 First, above is a vintage 1943 RPPC (Real Photo Postcard) of Joltin Joe DiMaggio playing ball in front of a large crowd of military personnel in Camp Cooke in California. Camp Cooke is now called Vandenberg Air Force Base. His swing is unmistakable in the photo as he looks up to sky in search of the ball that he just hit to deep left field. This postcard did not sell, but I think the opening bid of $1,500.00 had a lot to do with that. 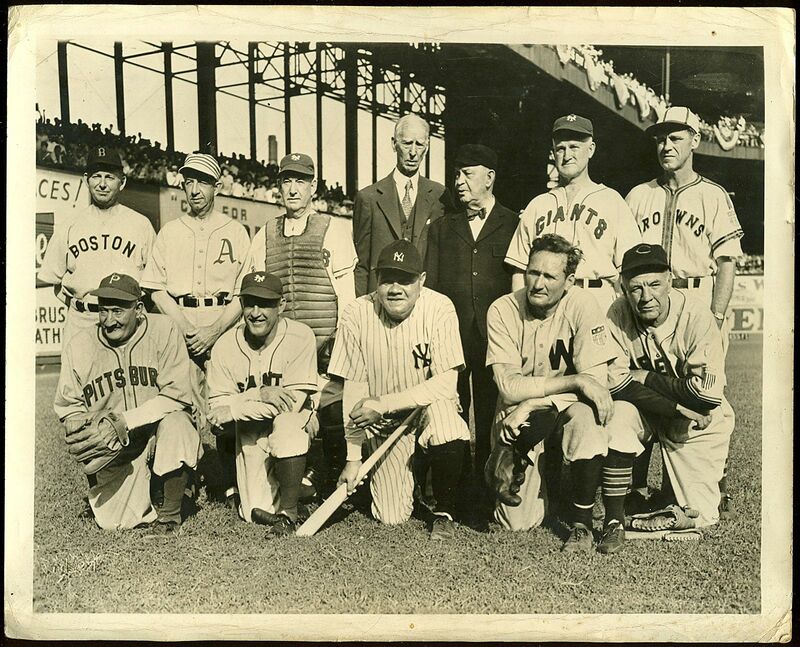 In 1943, New York Journal-American reporters Max Case and Bill Corum had the idea of assembling a team of All-Stars from the New York Yankees, Brooklyn Dodgers and New York Giants to play against a team of All-Stars from the US Army. Hosted at the Polo Grounds in upper Manhattan, the "War Bonds Jubilee" became a massive event, featuring actors, singers, comedians and dance bands, and was capped by an exhibition of baseball's all-time greats. "There were still 35,000 lumps in 35,000 throats around the village Friday, all because a dozen old men walked out on a ball field. As they spread out on their regular spots on the field, the lump you got in your throat and the moisture in the eyes of some of the most blasé baseball writers in the press coop were more than enough to prove that the baseball fan is at least part elephant. He never forgets. "It didn't matter that in fielding some of Babe's "practice shots" Murray fell down, Speaker was practically decapitated and Collins was all but carried into right field by a line drive. The folks had a look at 'em, and the Babe finally parked one. That was the icing on the cake. "That home run, which the mighty Ruth served up against the great Walter Johnson, would be the last home run Babe Ruth ever hit in a major league ballpark. The Jubilee would help sell a staggering $800 million in war bonds to help fund the American war effort.